Confession time: I am a bit of an app addict. I collect them liberally, trying out at least one new app every day I reckon. And with disk space not an issue on my N8, they pile up. My menu is reasonably well organised, with the apps split into folders, so actually finding them is not that difficult, but often it gets out of hand. I’ve done a bit of an application cull and with the assistance of the rather handy Swiss Manager Pro, I can report that I have 150 applications installed, of which 54 are built in and the remaining 96 my collection of third party applications. The latter includes, paid apps, a lot of freeware, selected beta applications and some weird and sometimes not so wonderful apps that probably serve no purpose whatsoever, but seemed like a good idea at the time. I got thinking about which apps I actually use on a regular basis. Some apps, like Googa Sync, which I use to sync my Google calendars to my phone, get little to no mileage but deserve a place among my collection. I verified my Google account, selected the calendars I wanted to sync and set a sync schedule and have never had to open up the app again. I only know it’s there because my phone calendar is always fully populated and in sync with Google. Others get medium use, and I would class Safe Wallet in this league. Some important information is held in there, encrypted and password protected, that I occasional have to pull out, like when I want to make changes to an insurance policy. Apps that give me access to social networks, multimedia apps, navigation etc are heavy use apps. These get used several time a week and even per day. But what are the apps I could never live without. If I wiped my phone and started again, what would be the apps hat I would reach for time and time again. This proved easier than I thought and I was surprised , or rather not actually considering my confession, how many apps are surplus to requirements. I have made them essential by simply ustilising them, but if a lot of the apps did not exist, I probably would not notice. I would simply find something else to fill the app void. Amidst all of that them I have distilled my app list down to five essential apps, each with their own story to tell. 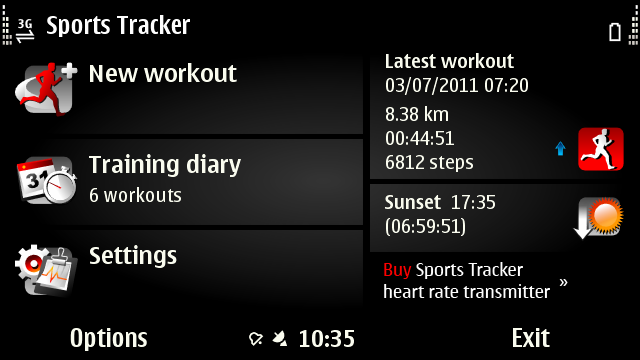 Sports Tracker is an app that I‘ve used since its days as one of the best Nokia Beta Labs projects. These days it is a multiplatform empire with Android and iOS added to the party and I’m guessing it won’t be long before Windows Phone and other platforms are added too. 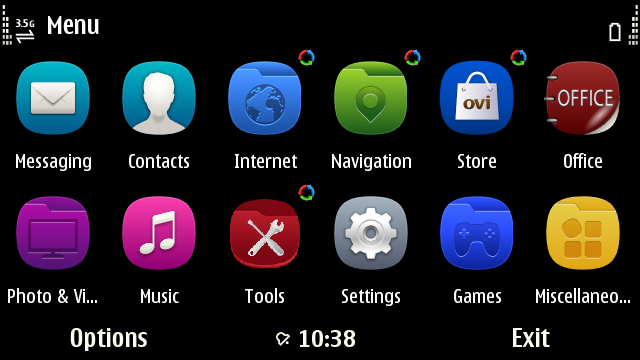 The Symbian app has taken a backseat, with the OS effectively sidelined by its parent company, and as such has lagged behind in terms of features and design compared to the newer shinier Android and iOS versions but it still packs a punch. It’s a simple concept really, utilising the built in GPS chip to track your geographic progress, the accelerometer as a pedometer, and the option to use a heart rate monitor for more advanced use, that is very powerful. This information is put together to give detailed information, that for me trying to get back into regular running helps me keep track of my progress. The web interface, though built entirely in flash is very useful. I’ve tried other apps like Endomndo and for me Sports Track is a landslide winner. I’m a long time Last.fm user, a service which has been the most accurate music recommendation tool for me, simply by paying attention to what I like and listen to through the nifty scrobble. When I was going mobile and eventually landing up on Symbian I was disappointed to learn that the platform was not officially supported with a native app. Thankfully a free app, Mobbler was already in existence, and has been faithfully scrobbling music played through my phone’s music player. 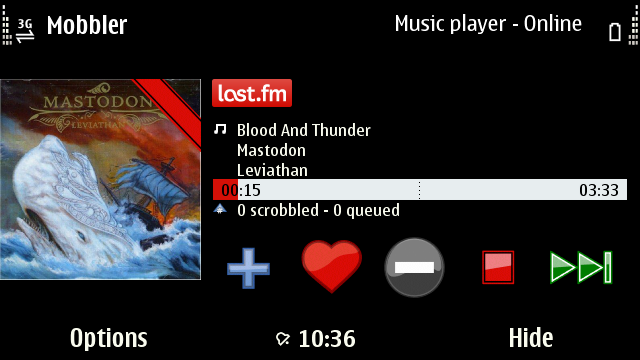 Whether I’m at home chilling out to some tunes or blasting music through my car system using the N8’s FM transmitter, I know my scrobbles are being sent off to Last.fm HQ to help me discover more music, thanks to this awesome lightweight app. 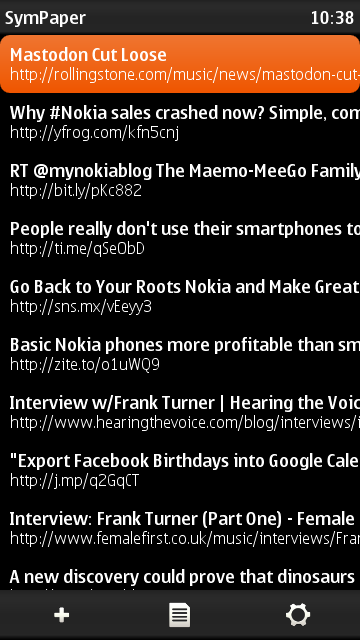 In other words Twitter, and if you mention Twitter and Symbian in the same sentence, you cannot and should never do so without mentioning Gravity, the rock star Symbian app! I never really got Twitter before and still don’t see it as a traditional social network like Facebook or Google+. The primary role of twitter has been to bury the RSS reader. I find it a faster, friendly and infinitely more engaging way to source content, in part due to the community orientated interaction paradigm but also surprisingly the 140 character limit. It means no verbiage a la Facebook style, and, this certainly applies to my timeline, the ‘headline+link’ method of delivery. Thus I can glance and decide without having to labour through a classic RSS reader like Google Reader. To make this work on mobile the app has to match that brief, fast, friendly, engaging demeanor and on that level, nothing beats Gravity. I’ve tried a number of clients and even the lure of freeware could not prevent me parting with, what is admittedly a lot of money for Gravity. And seeing how many posts on Twitter are shown as being posted ‘from Gravity’ shows that I am not the only. 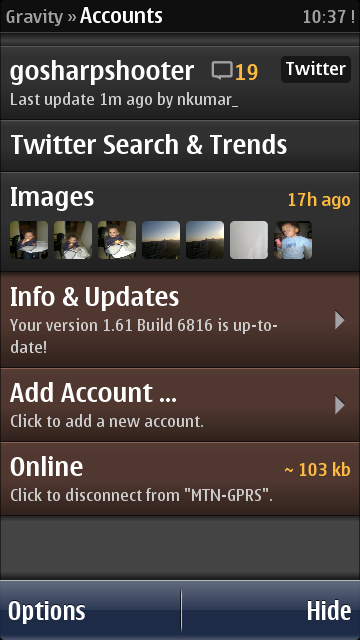 I already reviewed an earlier build of the app, and it has come even further since, and for heavy twitter users on Symbian, there really isn’t any other choice. I will go as far as to say this IS the best app on my phone. When it comes to doing a specified function, but doing with class, panache and intuitiveness, and even going beyond beyond the call of duty to make the experience that much more fulfilling, nothing beats Gravity. Working hand in with the content aggregator, but also able to exist on its own is a handy reading list manager. To this end I have been a user of Read it Later for about three months now. There often isn’t enough time in the day to go through all my reading material and with twitter giving me access to more content, being able to mark pages for later reading, at my leisure has been a godsend. So you can imagine my excitement when I learnt that Gravity can also share links to Read it Later, only to have that excitement dampened by the lack of a Symbian client. But as I wrote in an earlier post help was on the way through the excellent SymPaper. Payware it might be but like Gravity, the expense is insignificant when I look at how much mileage I have already gotten out of the app. And with the updates confirmed, the app is now utterly gorgeous with improved sharing capabilities. So there you have it, five apps that alone would service my needs on my mobile phone. For everything else, if forced to, I would simply jump into Opera Mini and use the web version of the service or simply do without. But for these there is simply no compromise, and it’s these five apps that make my N8 such a pleasure to use on a daily basis, as with the exception of Sports Tracker, these do get fired up daily, often a few times in fact.